Pelican L07--new ownership, completely updated!! Addition coming in the Fall: A built in gas grill with a wraparound granite bar and sink. 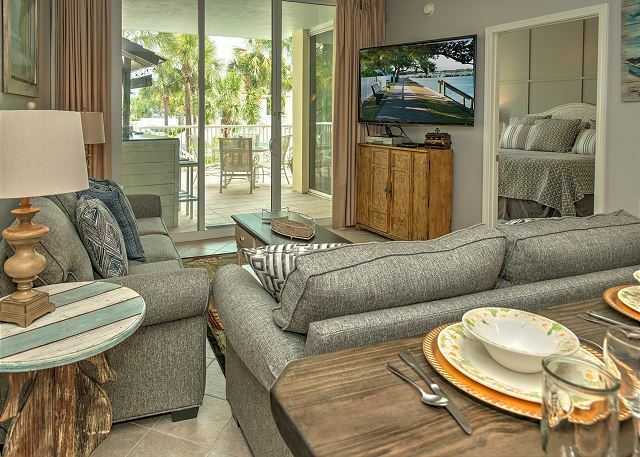 You will love sitting on the lower lanai level bar stools watching the family in the lazy river/pools, while grilling on the gas grill! 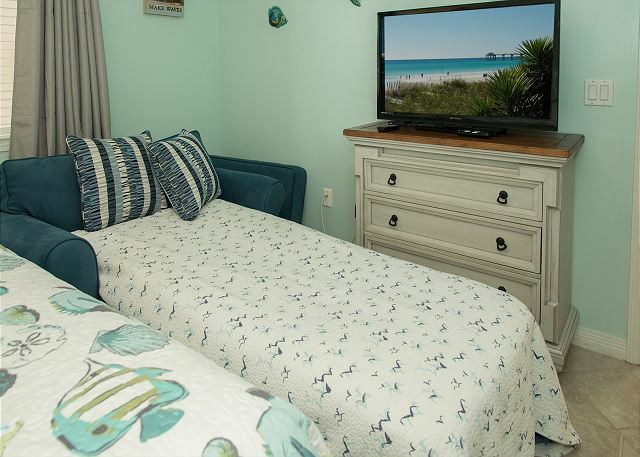 Spoil your family by spending your Florida vacation staying at Pelican L07. 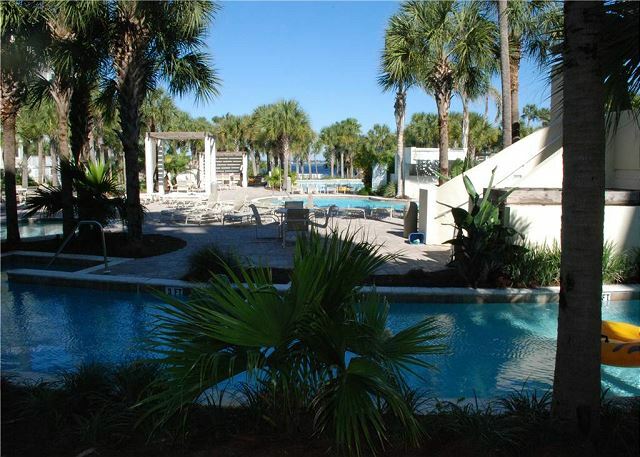 This condo is in a beautiful location just steps away from all the fun. 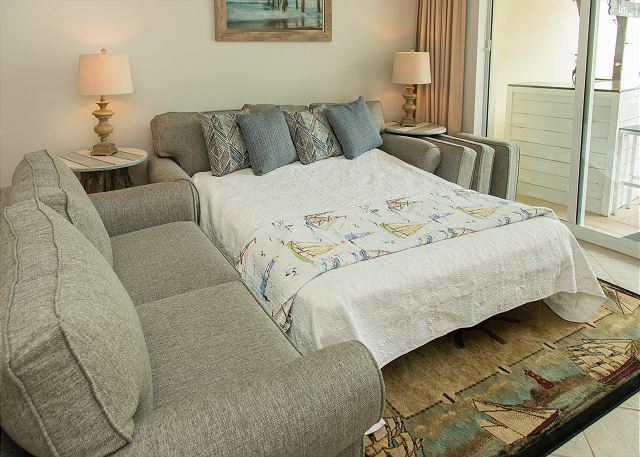 Having a Lanai level condo makes accessing the pools, lazy river, and all other amenities very easy. 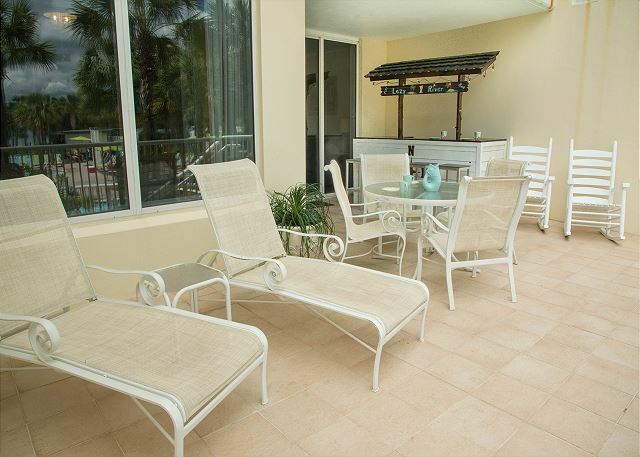 The beautiful split-level patio gives a large outdoor space to enjoy the custom made Tiki bar, loungers, and table/chair set right outside the living room’s sliding glass door. 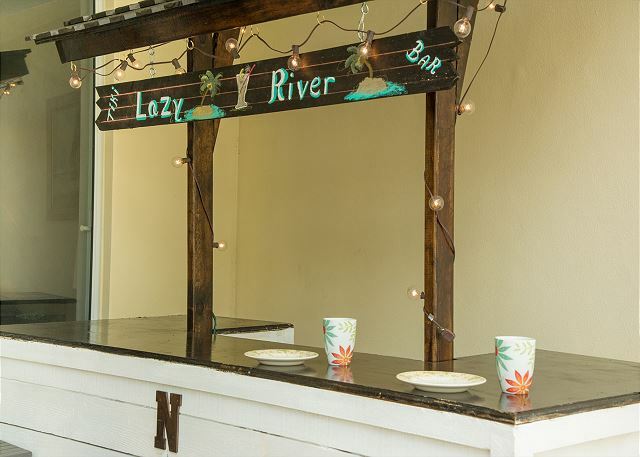 The lower level has a gas grill to make a family meal while watching the family float around the lazy river. Having your own Lanai level unit allows adults and kids to get to the fun quickly and easily. There is nothing better than that! 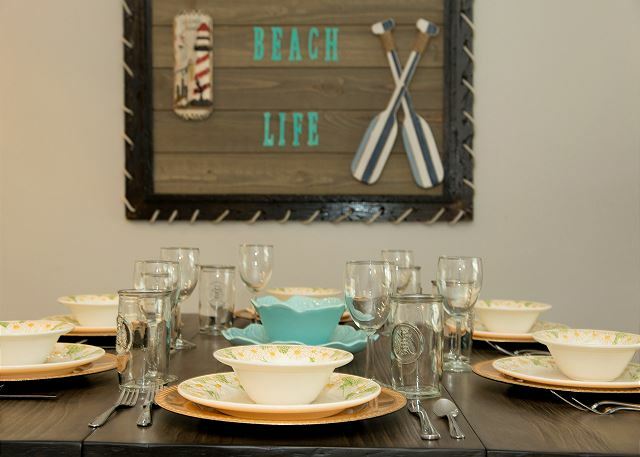 The condo is decorated in beautiful beach décor that will allow you to relax and enjoy your vacation as soon as you arrive. This unit has all ceramic floors, which is great being so close to the water fun. There are rugs in the living room and all three bedrooms that match the rooms décor. The kitchen is stocked with everything to make a gourmet meal or just snacks for the day. You can enjoy eating at the bar, table, or outside on the patio. 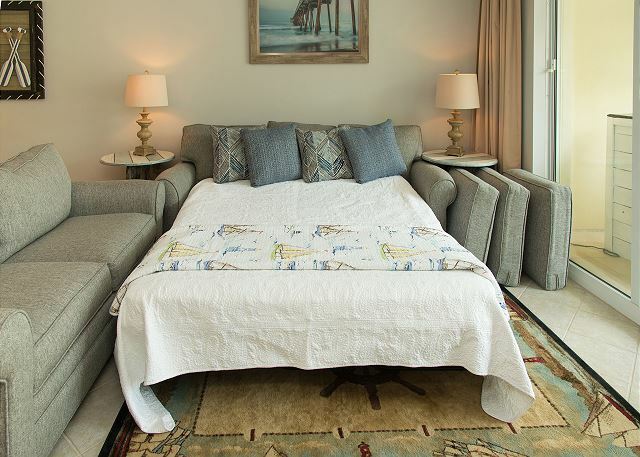 The living room has a large flat screen tv to enjoy while seated on the sofa or love seat, both turn into a queen sleeper and a full sleeper for extra accommodations at night. 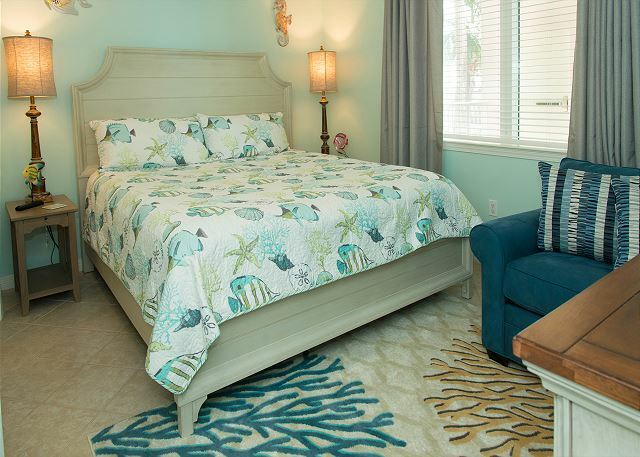 The master bedroom has all the luxury you need after a day of fun in the sun. 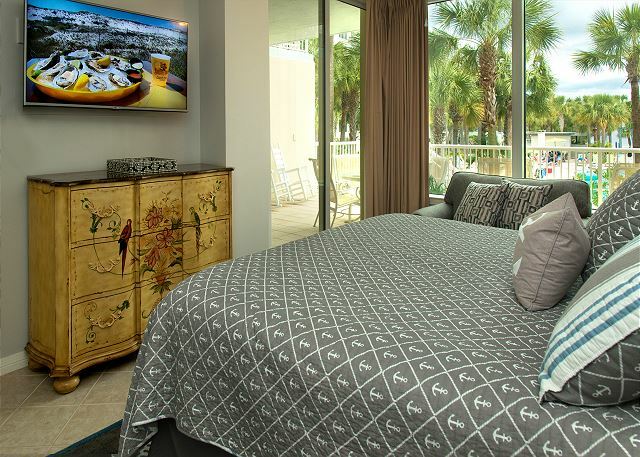 A king size bed with views of the lazy river and pools is great to wrap up the day. Also, there is an over sized chair to sit and enjoy quiet time. The chair in the master turns into a twin sleeper, which is convenient if you have a little one. 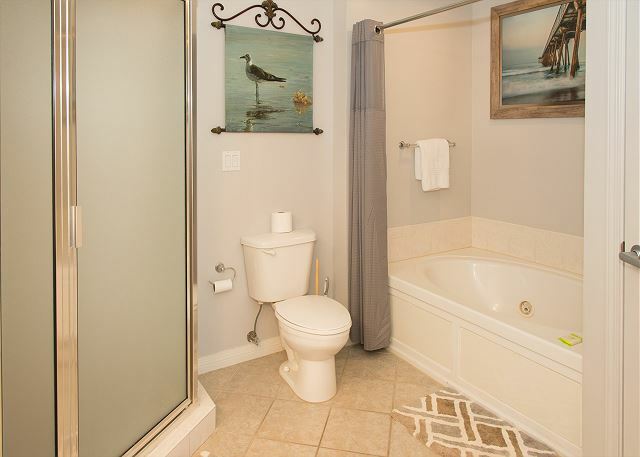 The master bath is very spacious with a jetted tub, separate shower, and two sinks. The 2nd bedroom has a king bed and has private access to the hall bathroom. There is also an over sized chair/twin sofa bed in this room just in case you have a little one that needs to be close to you. 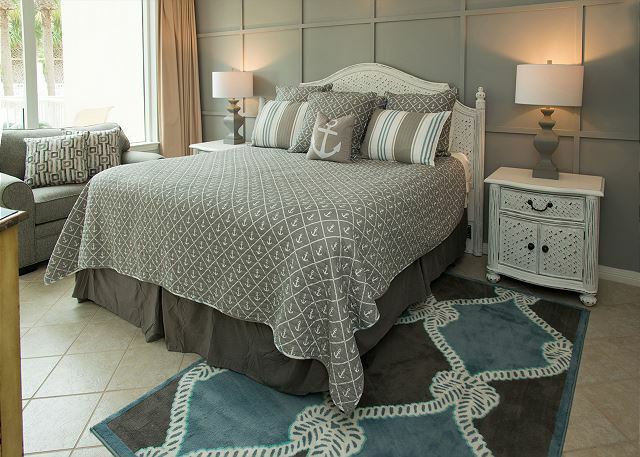 The 3rd bedroom has a nautical theme that the kiddos will love. 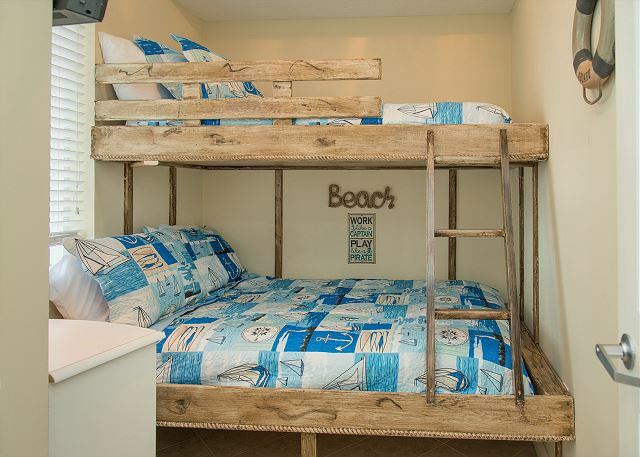 The bunk beds, full size on bottom and twin on top, will be a kid to teen’s favorite place to unwind after a long day having fun. All three bedrooms have flat screen tv’s for everyone’s personal enjoyment. 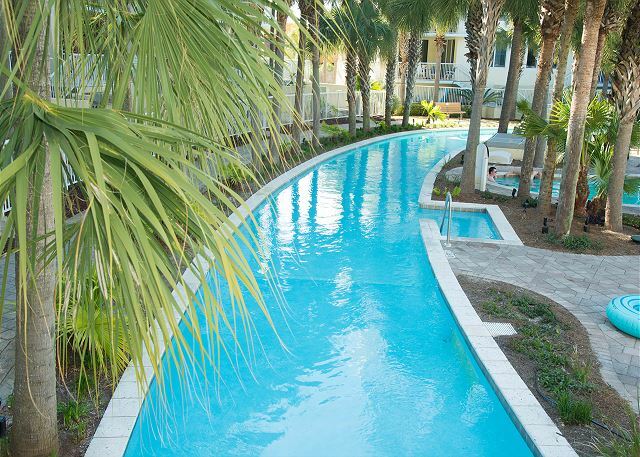 The 700-foot-long, 10-foot-wide, and 4-foot-deep lazy river with a man made current passing by right in front of your lanai level condo. You can watch the kiddos enjoying themselves as they pass. This Bayside Resort also has a Waterfall pool, Zero entry pool, and 2 large community hot tubs to have more fun. The beach side of the resort has one of the largest pools on the island and, also a partially shaded pool that you can use. 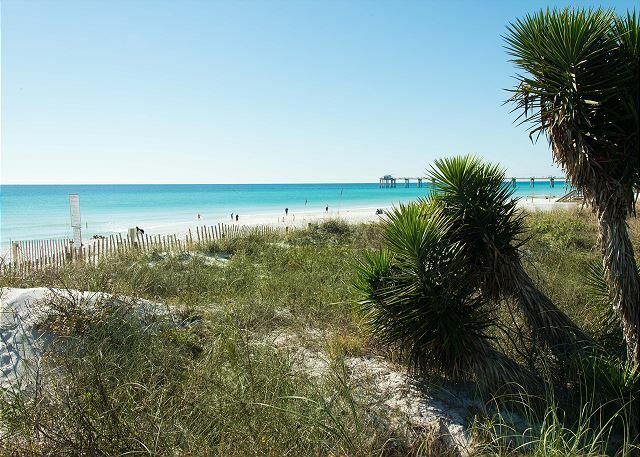 The beach and emerald waters are also one of the many things to do at the Destin West Resort. When visiting the beach, we have you covered by providing access to a wagon, chairs, umbrella, and sand toys for beach use. The sky bridge connecting the bayside and gulf side areas of the resort is great for easy transitions from lazy river area to beach fun! 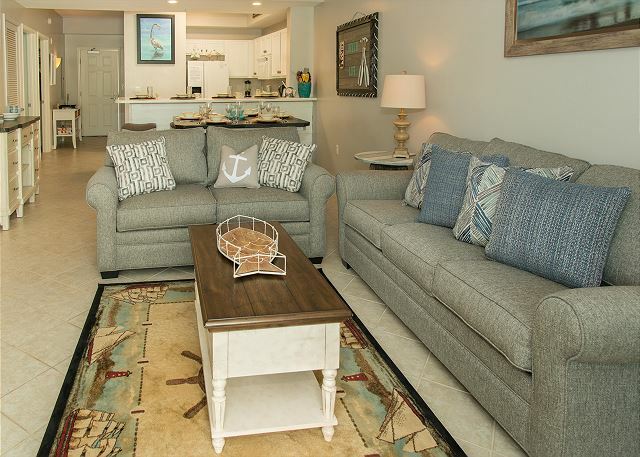 No time to wait because Pelican L07 has it all, and just waiting for you to book your best vacation ever! Dear Mr. Johs, Thank you for your wonderful review of Pelican L-07! We're so grateful that you took the time to recommend some of our local hot spots too! 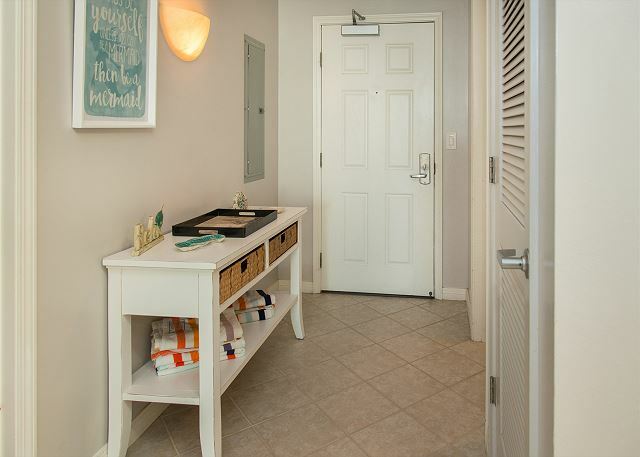 We're so glad you enjoyed your time spent at Destin West Condos and will look forward to your next visit! Please come again soon! It was a great place to stay! I had a great time! Really enjoyed the lazy river and all the scenery. Dear Mr. Fairbanks, Thank you for taking the time out to leave us such a wonderful review! We're so happy you enjoyed the tropical scenery! We're always here to help you book your next get away! As described in ad, nicely furnished unit. You won't be dissatisfied with this one. We loved that the pools and lazy river were just outside our balcony. We'll definitely be back again. Dear Mr. Brown, Thank you so much for this lovely review! I couldn't agree more about this unit! It has been recently updated and I love its location! We'll be looking forward to helping you book your next trip down! Dear Mr. Doran, We so appreciate your wonderful feedback! We're ready to book your next trip whenever you are! This condo was perfect for our family of 4 adults and two kids, age 9 and 11. 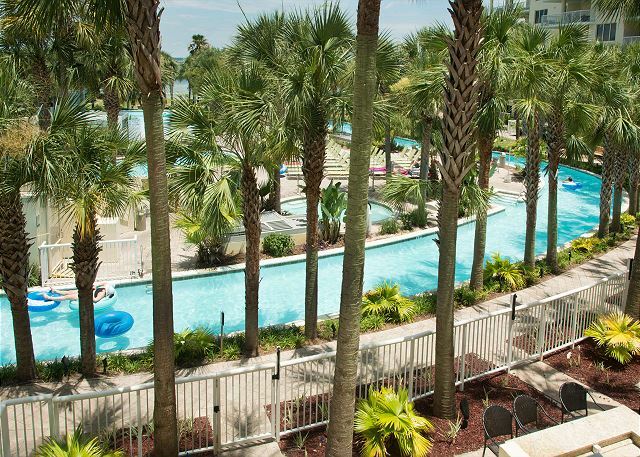 Being so close to the bridge to the beach and being able to practically step out of the condo into the lazy river/pool area was great!!! Beds were comfortable and clean - areas were laid out well with an upscale decor and relaxing theme! We used the beach chairs and toys from the garage area just about every day! Parking was awesome as well!! We all agreed this was probably the best vacation to date. We all want to go back and recommend this resort and condo highly!! Dear Ms. Stout, This review says it all! We are in this business to bring families together, and I'm so glad you all had a wonderful time! We can't wait to have you back again soon! 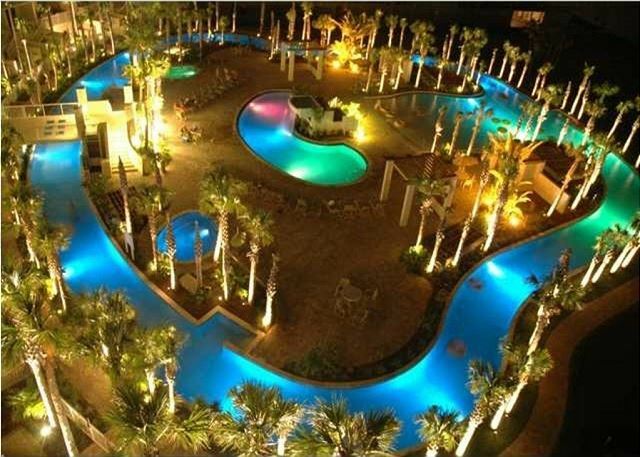 Destin West Resort was amazing! This was our second stay at Destin West, first time st Pelican L07. The condo was very nice the location could not have been any better for my special needs daughter who does not walk well without her braces. We loved everything on the property it was a wonderful paradise for all. The condo was very nice,I was very sick for the first part on our stay and I rested comfortably in the master bedroom. That was very impressive to be comfortable away from home. However the twin bunk is not too comfortable according to my son, who complains about nothing. The sofa sleeper was also very uncomfortable unfortunately, which was where my other son slept there was a bar thru the middle of the mattress so he slept backwards on one side and ended up falling out of bed injuring his shoulder pretty bad. These kids are adults and don’t say much I didn’t even know it happened until he kept icing his shoulder. I think toppers are a must! The condo had beach towels for us which was much appreciated and the garage for gulf fun was amazing, when we took my daughter to the beach the life guard actually asked us if we twanted a beach wheel chair, so appreciated it. She got to get in the gulf for awhile and enjoyed it. The condo actually had everything we needed, but the can opener did not work asked the guy who came to look at the air conditioner if he could get us something that worked and he said he would put in s work order for it but we never heard anything about it after that. All in all our stay was very enjoyable. Dear Ms. Verhoff, Thank you for letting us know about the comfort concerns of this unit. These are new furnishings, and the comfort was an assumption we wont overlook for the next guests. Your feedback is vital in making this issue a priority and we are grateful! 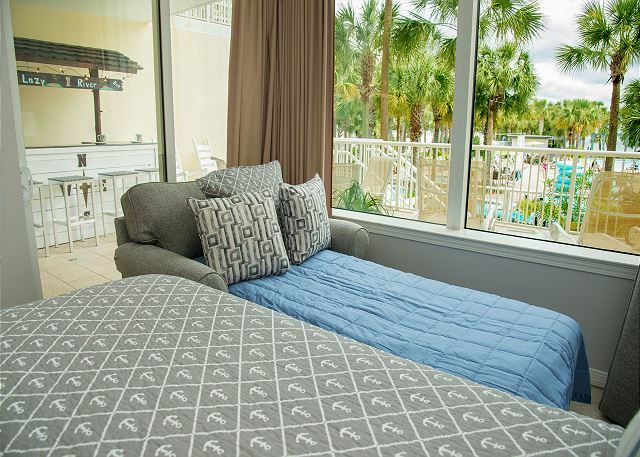 We are also pleased to hear that you enjoyed your time at Destin West and found the Master Bedroom very comforting. Thank you for recommending us to your friends and family. We will look forward to booking your next trip! The rental was clean and beautifully furnished. We had all the kitchen supplies we needed, and plenty of extra pillows. Another blanket for the fold-outs would have been useful, and for warming up after cooling down from being out in the sun all day. The property was beautiful, well-manicured, and maintained. The garage of supplies was perfect for us because we didn’t have much spare room in our car for a large umbrella or beach wagon, in fact, riding in the wagon was one of our toddler’s favorite things to do during the vacation! We did not hear any noise from the rentals around us, so I am hopeful that our loud toddler didn’t disturb them either. 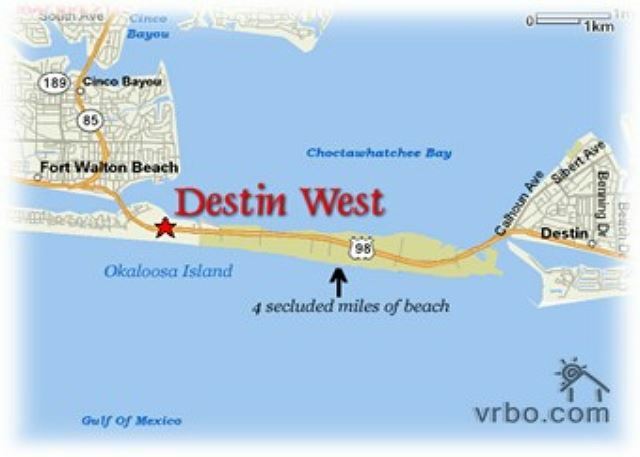 We had ages 1,6,13,15,37, and 59 with us for this trip, and we ALL enjoyed various features of the Destin-West resort. 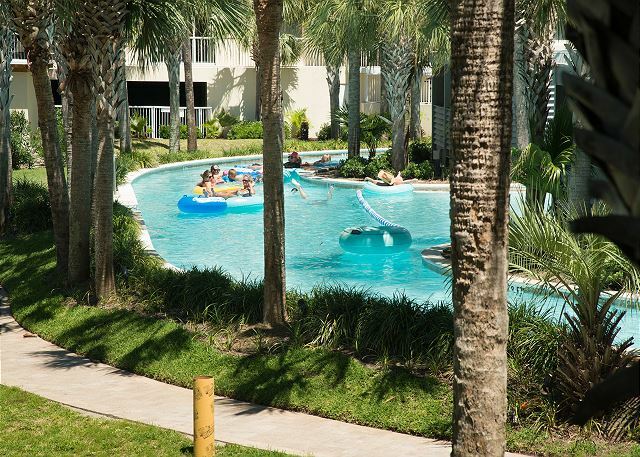 We will definitely be back to enjoy the area, and would stay in the exact same property again, as the location was very convenient to everything we needed: pools, garage, and elevators leading to the breezeway. Thank you for taking the time out to let us know how much your family enjoyed your time here! We are so happy to hear that your vacation was a great experience and truly look forward to having you back again soon! Very nice condo. Great location, I will recommend it to my friends and family. Spring Break 2017 is in the books! This was our second year at Pelican, first I’m this condo. We chang d condos to be on the ground level and it paid off!! Great location, both for the complex and the unit! We had awesome access to the pools, garage, and our friends in other units. Great view over the pools of the bay. Inside was newly updated and so beautiful! On several walls we found scripture painted which was a great way to focus and appreciate the blessing a a great vacation! I found myself singing, “grace, grace, God’s grace...” every morning as it was on the bathroom wall. If I had to find an improvement it would be for more stools for family dinners. We had 5 and the weather was dicey so we couldn’t always eat on the deck but the table only had 2 stools. The bar had 4 but they were too tall for the table. My instinct is the table was new and the stools were on back order but I’m not sure and this was not an issue, just a thought. Finally, being Extremely picky...I do like a crock pot on vacation so I can go out and come home to a meal. I could not find one. Again, I could totally bring my own and this is not a deal breaker. Overall, rent here you will be very pleased. And THANK YOU for being a minister to my family as we were blessed to be on vacation. Dear Mr. Paris, It is a wonderful thing to know that you had such a great experience on vacation! Thank you for letting us know about the crock pot, as all of our units are supposed to have one. We will be sure to remedy this. It is feedback like this that gives us direction on what we need to improve. Let us know when we can book your next stay! Overall a really great experience. I've stayed at Destin West several times, but this was my first time staying Bayside. The communication was great before and during the stay. We were cut a day short by Hurricane Irma, but it was all good. The best part was having the large patio overlooking the lazy river. It's literally right out the back door. Dear Mr. Forshag, I'm so sorry that you had to leave a bit early. 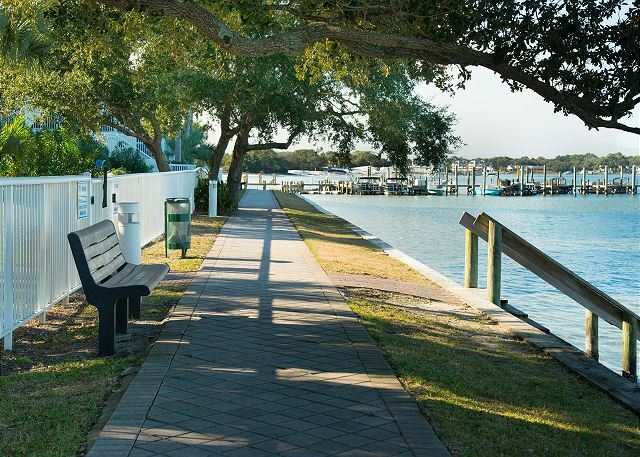 We're thrilled to know that you enjoyed the stay on Bayside, and I must add that it is my personal favorite! Please let us know when we can book your next visit! Wonderful. I just wish the Jacuzzi at the lazy river worked. I looked forward to sitting in that all week, but never worked. Everything else was great. This is the second time we visit the resort. Loved being on the bottom floor. With a two year old and a four year old it made things easy. Dear Ms. Authement, Thank you so much for giving us such a wonderful rating! We truly appreciate your feedback and look forward to your next visit! We had an awesome time at this condo. It is right at the entrance to the Lazy Rive and Pool area which is great when you have little ones. Loved the outdoor space also. Whole facility is very well kept employees are polite. We hope to rent again soon. Thank you Tanya for the great review. We hope to have you as a guest again in the near future. Our vacation described in one word...AWESOME!! This condo was great for us. The space is larger than we expected-much larger than anything we've rented in Hilton Head,etc. The bunk room was perfect for our boys. It was also decorated really nice & had everything we needed & more, stocked kitchen, plenty of towels, etc. The location near the pool was PERFECT & our boys LOVED the lazy river. Everyone was very helpful, at the resort (although when we 1st arrived the lady in the front office was quite rude & unhelpful. We only needed a parking pass & she said she wouldn't even talk to us because we rented online). I understand, but how were we to know it was a different group. We found the condo online randomly & rented it??? We thought this was a prelude of how the trip was going to be, but not so. Everyone else was so nice. They kept the grounds really clean & maintained. I loved being on the bay side & going to beach was not too much effort. Having the garage with all the wagons, chairs & toys was very classy. It made going to the beach a breeze!!!! We will be back again!! Thanks for a great trip!!! Tina I am so sorry that the lady at the onsite rental office was rude to you. We are not associated with that company at all so unfortunately can not control their behavior. We try to make clear that we do not have an office and we take care of everything via email, phone or at your door. We are glad that you found us and rented from us even if it was random. We look forward to having you as our guest again so please keep our info so you do not have to find us randomly. We had a wonderful time in this pretty bayside condo. Ideal for a family vacation. Shared this condo with another family - 7 people. One family took the master and had a blowup mattress for 1 kid. My husband and son took the 2nd bedroom, and my daughter and I shared the bunkroom. There is a sofa bed, but we wanted to avoid having someone sleep in the common area. The condo was clean, well appointed and comfortable even for 2 families. The owners were responsive and friendly and we even set up deep sea fishing with them. There is a nearby garage filled with beach items for guests to use. They could use updating, but we were glad to have the cart and chairs for the beach. Nice touch. Kitchen totally equipped. Could use a new coffee maker. Fave feature was being on the lanai level with a LARGE 2-tiered patio leading straight to the lazy river. Patio really expanded our space. Nice patio furniture/grill. Parasailing and jet skiing from a place just next door. Master/bath both large/plenty of storage. Second bath adequate for 4 to share, but could have used shelf space over the commode and maybe some hooks (in bunkroom too), but it worked. Closet in bunkroom is an Owner's closet. It is a fun little room (w/TV) if you don't keep too much in it. TV in the den area huge (with lots of stations), and the two chairs are recliners. Wifi worked pretty well, and there were a couple of ethernet cables for the two laptops that kept dropping wifi. I think we had a lot of devices set up for 7 people.